I am always confused when people rave about denim yarns -- you know, the ones that shrink significantly after you wash them? How on earth is that a good idea?! Especially for someone with monkey arms, like moi. Oh wait, do I hear a knitting dare? did you just dare me?? Ok, I'm doing this. 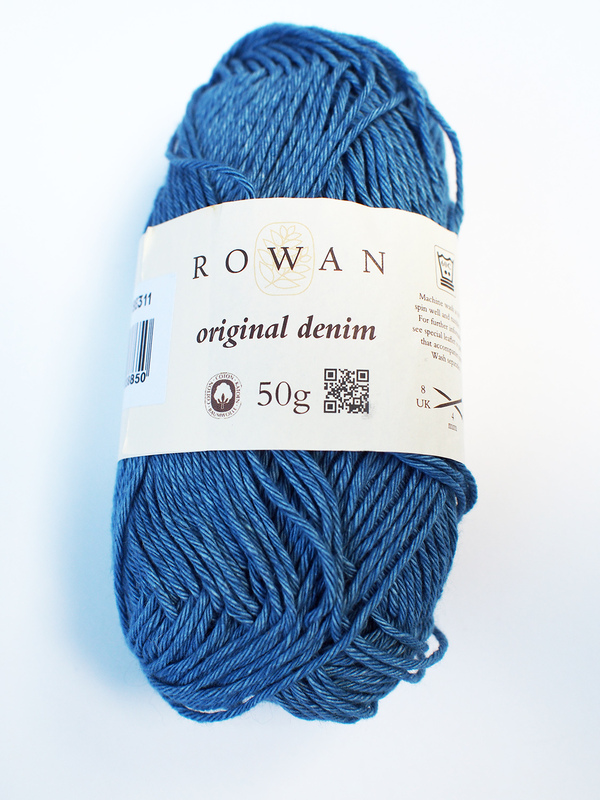 Rowan has carried a denim yarn in one form or another for many many years. The forms change because the mills and sources change, and denim yarn lovers really weren't thrilled with the last version "Denim" which was discontinued last year: too soft, too floppy, no good denim feel. "Original Denim" replaced it this Spring and I got me some. You can certainly feel the difference. I know because I've got them both in front of me as I type this -- and the new one is strong and sturdy, like a pair of workman's Levi's. The old one? It's so soft that it's that pair that is going to rip a great big hole in a very compromising location... tomorrow. But Rowan also just released a booklet, Denim the Next Generation, filled with patterns by Martin Storey including my fave, Penzance Cable. I really didn't want to do anything that complex though, and anyway, I find long-sleeved cotton sweaters to be too heavy to wear. 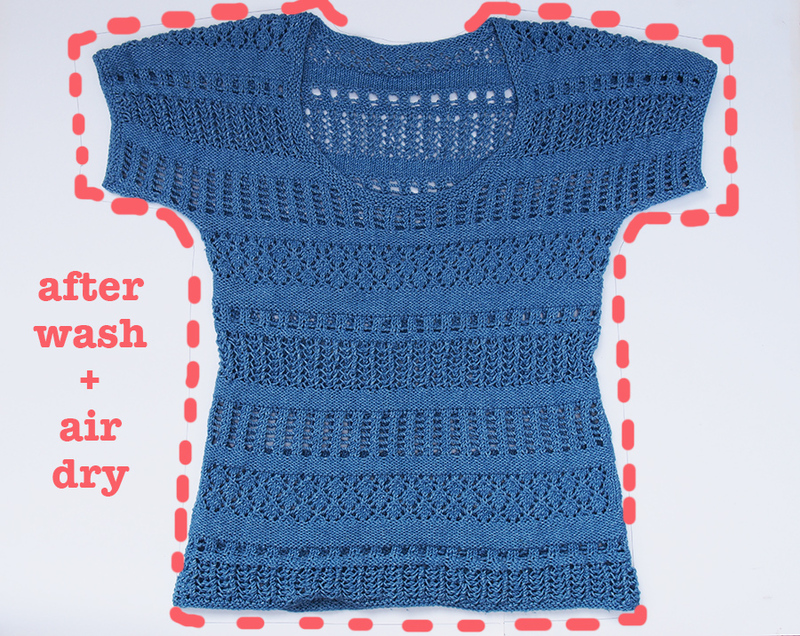 I wanted to be able to take *any* worsted weight yarn pattern and adapt it for denim. So I did me some math on the gauge difference (28 rows changes to 32 rows after washing), and I'm going to give you the secret. 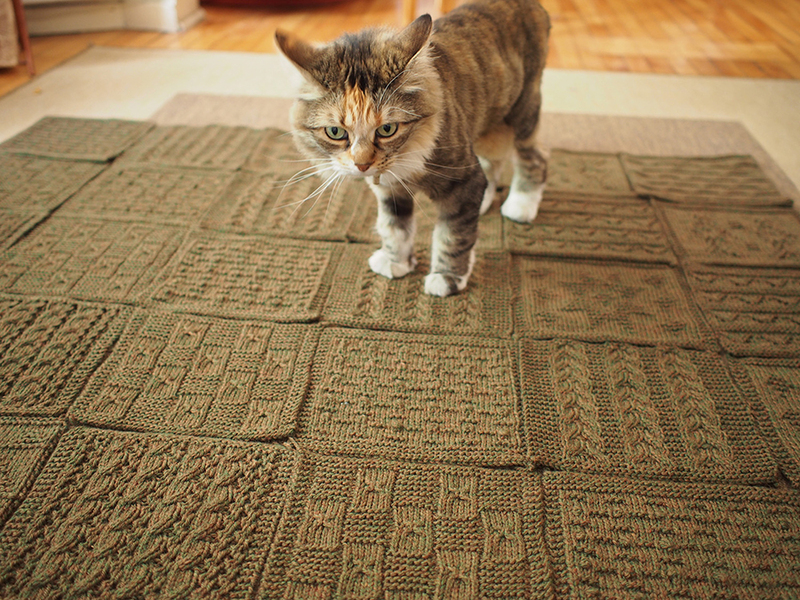 1) After every 7 rows of stockinette stitch, knit one extra row. Then knit 7 more, and knit another row. Repeat. 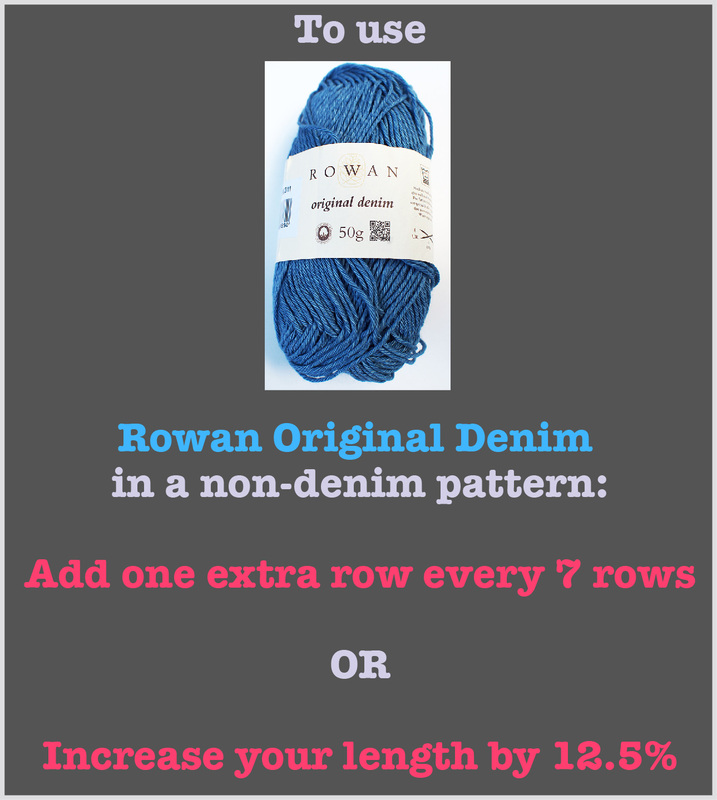 2) If the pattern says to knit 50 cm, knit (50cm + (50cm x 0.125), or 56.25 cm with Original Denim. An easier calculation for this is: 50 cm x 1.125 = 56.25 cm. I've been told by Rowan that stitches other than stockinette may shrink differently, so if you want to tackle a non-stockinette pattern, you probably want to make a swatch and wash it to really figure out the difference. 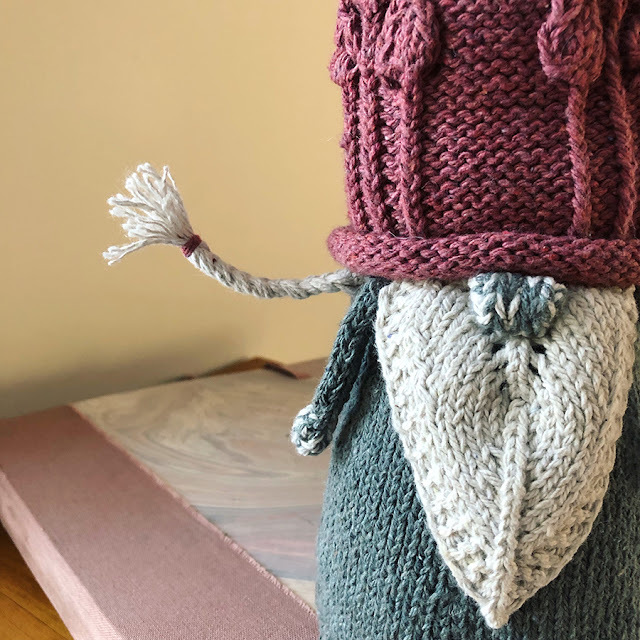 But I heard that knitting dare ringing in my head, so I decided to do something wild and crazy with a ton of different stitch patterns and show you what happens. I chose a pattern from the Silkystones book, which is another worsted weight yarn released by Rowan last spring. This is Cascade by Marie Wallin. It's awfully oversized, so I thought this would be ideal in case it shrank in all directions. But to be honest, I removed a ton of stitches in width because it just looked gigantic: I went from 109 sts per side to 89! I also followed my rule to add 1 row for every 7 knitted, adding them easily in the reverse stockinette sections. I started this in Maine, where I discovered that those pockets in foldable chairs actually have two functions. 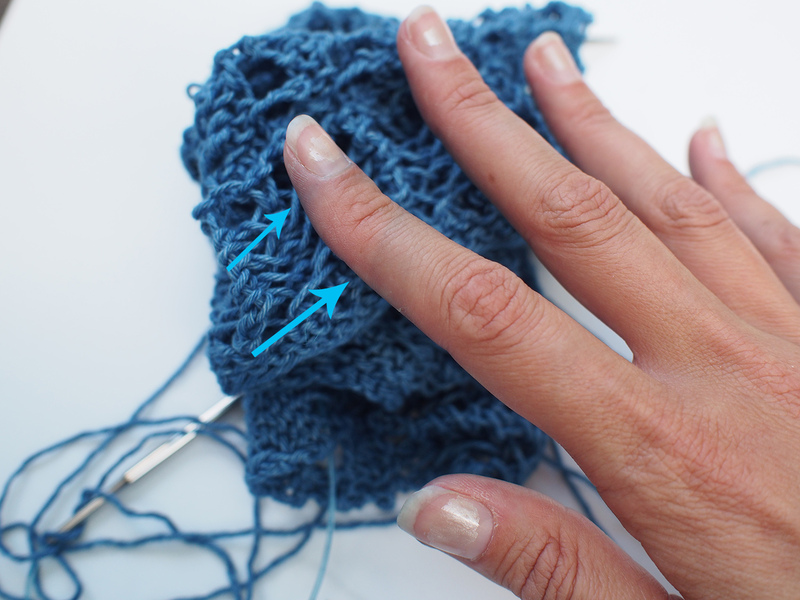 I also learned that denim yarn makes your hands blue! 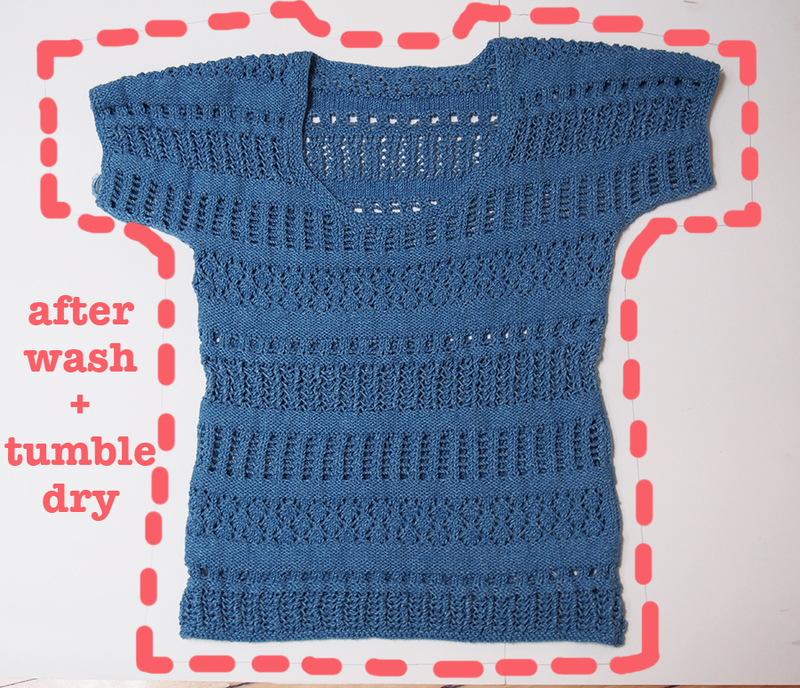 It's easily washable and it takes a good stretch of knitting to start seeing it -- but be aware. This also translates to washing your piece *alone* for the first time, ok? It's going to be in hot water and it is going to bleed like a smurf. I decided that all this would be the most informative for you if I showed you how it shrank. So I laid the finished piece onto cardboard and traced its outline. Then I washed it in the hottest water I had (which wasn't even the recommended 60C) and paid $2.50 at the local laundromat to tumble dry the darn thing, as we do not have a dryer in the house. Holy crap, it had shrank like mad in all directions! Not only that, the dye had really run off, and some of the stitches were almost white! Let me tell you, this was not what I expected. However, what I absolutely loved was how the stitches suddenly popped out of the top. I mean, every stitch was tight and defined and looked perfectly performed. OHHHHH>>> THAT'S WHY PEOPLE LOVE DENIM YARNS..
Phew! I must say this was a fun experiment. Although, I might have been crying if it wasn't wearable, who knows. Actually, on the crying side, I spilled strongly steeped Earl Grey all over the lower front of the thing shortly after all of these photos, and oh the irony: you wash denim garments repeatedly just so that they'll get this lovely fade to them (due to the overdyed nature of the yarn), but the moment you spill any color on it, it sticks like nobody's business. There is NO getting it out, sigh. If you like or hate denim yarn, tell me! And tell me if I've scared you off or made you curious, lol. Great experiment! :) I love this design in Denim......and think it was the openness of the stitches that made it shrink in width. A solid knit like the designs in The Next Generation....just shrink up. I absolutely agree. And that was good for me, because for some miraculous reason the stitches at the waist seemed to cinch in more than the stitches at the hips... it was like no-think waist shaping! Most people can't see the tea until I point it out. Then they see the tea. And only the tea, lol. I can't decide if I want to kiss or curse you. I have shied away from the Kim Hargreaves denim patterns because of this shrink phenomenon and now I don't have an excuse anymore because you provided me with MATH. 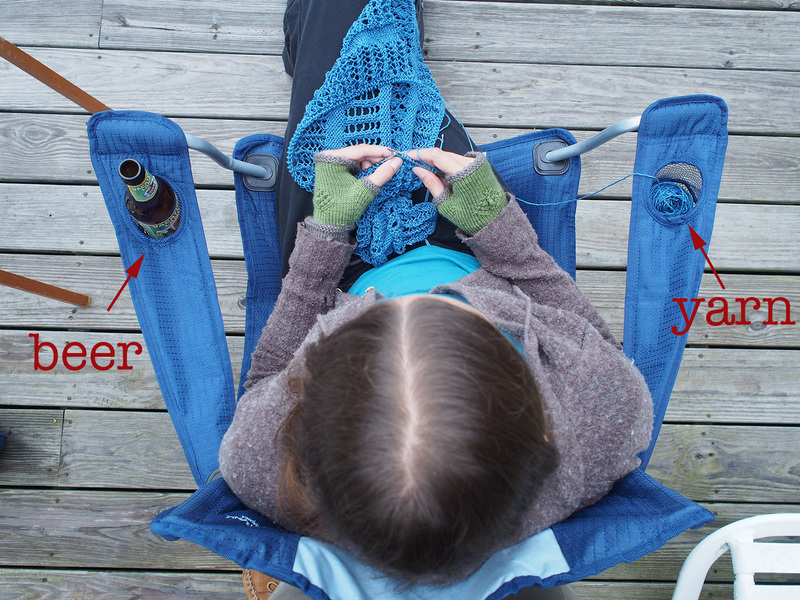 Much like a good pair of jeans, I love how the top faded (and the shot of the beer in one cozy and yarn on the other is fantastic). You are brave! The only piece I knit in Rowan denim was a pair of baby pants that just shrunk a little bit, as expected, but I hated knitting with it. I found it coarse and rough on the hands. So I don't think I will ever try a full size sweater anytime soon. Your top is lovely though, I like the miltiple pattern and lace effect of that tee. And sorry for the tea spills, I'm not sure how best to remove this. Maybe it will disappear with time and multiple washes. Hope it does. Actually, when I washed it, the denim color faded more and the tea became more obvious, lol! Try tea-dying the whole garment! At least then you won't notice the stain. Unless the previously-stained area comes out double dark - could that happen? 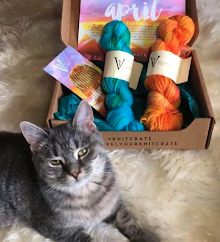 I am VERY curious to try denim yarn now - thanks for the informative lesson! 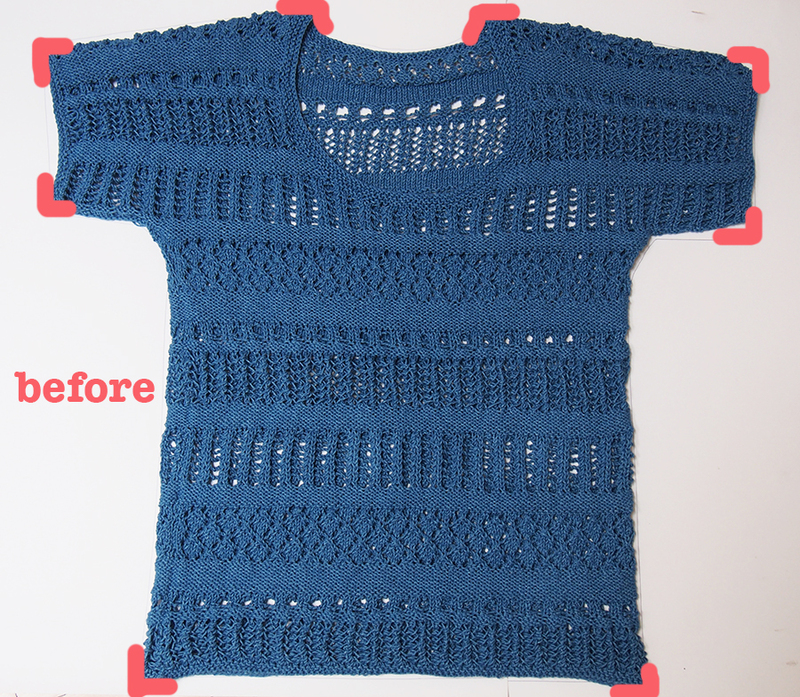 Your top looks fantastic - I do love how the stitches pop! Thanks! I'm thinking of making a cabled beret next. I like it very much! fantastic! Great idea! My husband mentioned that, too. I wish I like the tea color more though, it is very yellow-brown. Ooops! I see someone beat me to the tea-dying punch. Sorry! Another great tutorial, Dayana. You're so generous with your time and analytical skills - many thanks! Hi Dayana great post and great blog! Hi Dayana, I have a similar problem to Michela's. About seven years ago I knitted a cardigan in Rowan denim and wore and washed it loads - to the point that I got fed up with it and in a fit of bravery (or madness) unravelled it. 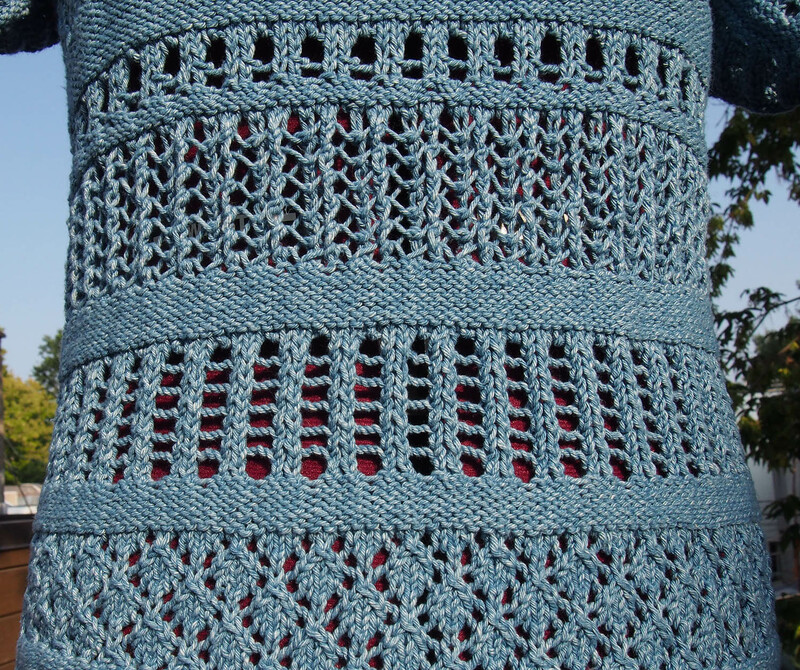 I want to knit something else with it - I have the Rowan denim Katy pattern - but don't know how to do the conversion of washed yarn to unwashed yarn pattern - can you help?! Hi Janis -- well first I would say... now that you have washed the yarn, you have the pattern world at your fingertips! If I were you, I'd pick any pattern that matches your gauge and forget this Denim nonsense. 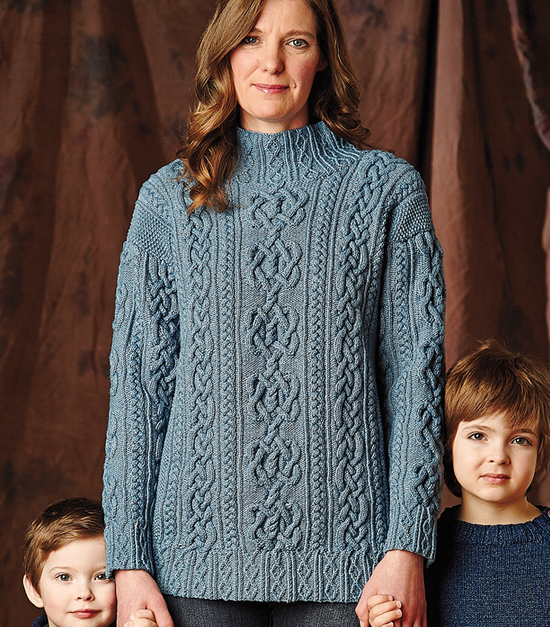 But, ok ok, let's say you really want to knit this! :) I think you can just do the same thing in reverse. That is, reduce every 8 rows of stockinette to 7 (or knit 12.5% shorter). This requires a little foresight -- you'll need to figure out how many rows you are probably going to knit and then subtract. And if I remember, the Rowan schematics are very poor and probably only show the knitted length, not the target length? Perhaps you will be lucky and can do it by length. Good luck and thanks for reading! hi Dayana, thank you so very much for your advice. I'm now on the hunt for a new pattern that matches my newly completed tension square! 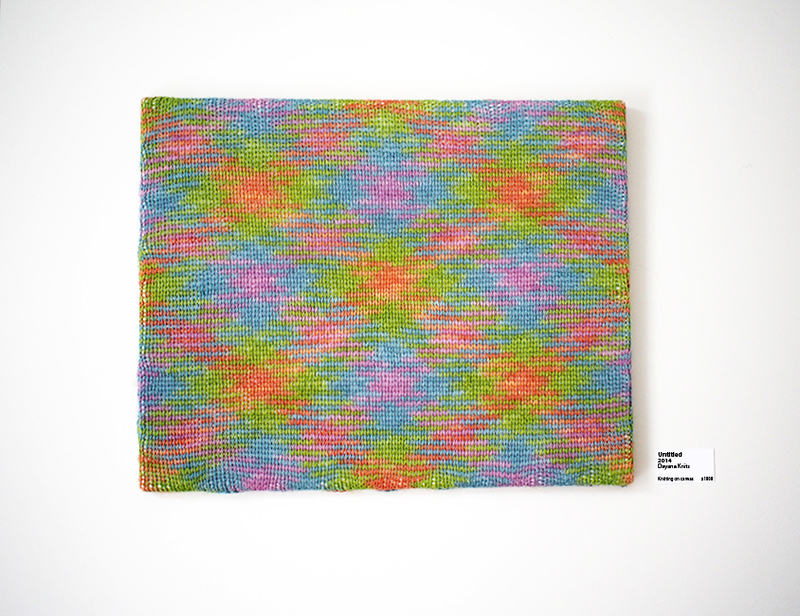 I love your blog and am finding it extremely inspirational - keep up the fantastic knitting! Hi. I have been given 20 balls of this yarn. 20! I can live with the colour bleed and then it mentioned the shrinkage. Not at one with maths. Any how bit the bullet today and found you. 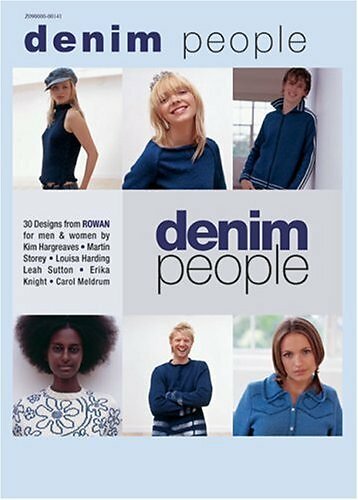 I was thinking of knitting a babies denim jacket, like a real denim jacket and now I know what to do. The tea stain. You can try a solution of 1 tablespoon vinegar to one litre water.Soak the stain for 15 minutes. Could be iffy with this kind of yarn. Or (let's go lateral) make up a strong solution of tea and overdye the whole thing. I've done it before with a coffee stain. 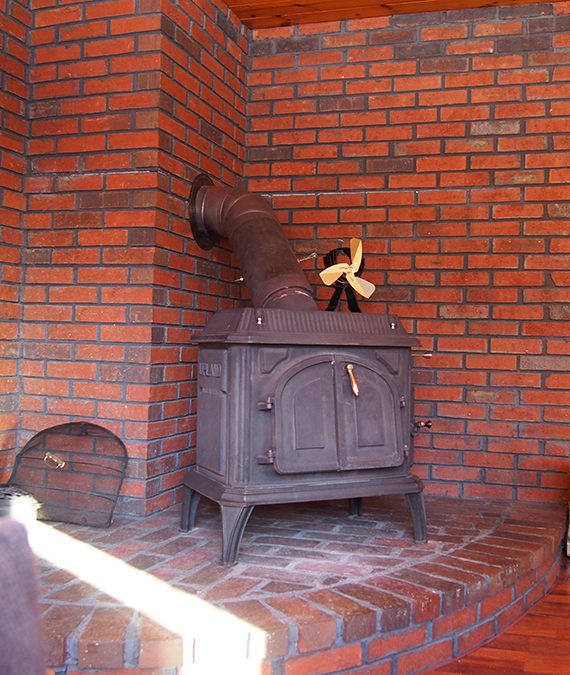 Gives it an aged look. Thanks for the help. Thanks so much for the stain advice! I've thought about the tea everywhere and then thought, would that spot be now darker than the rest?! Ugh. Best of luck with the baby jacket -- that's a good way to explore with denim probably. You definitely have a lot of it!! Be careful using vinegar on any fabric trying to remove a stain. Vinegar is used as a mordant to set colour when dyeing. Can you tell me if this yarn keeps fading. I have been given 21 balls of the original. Just found something interesting. 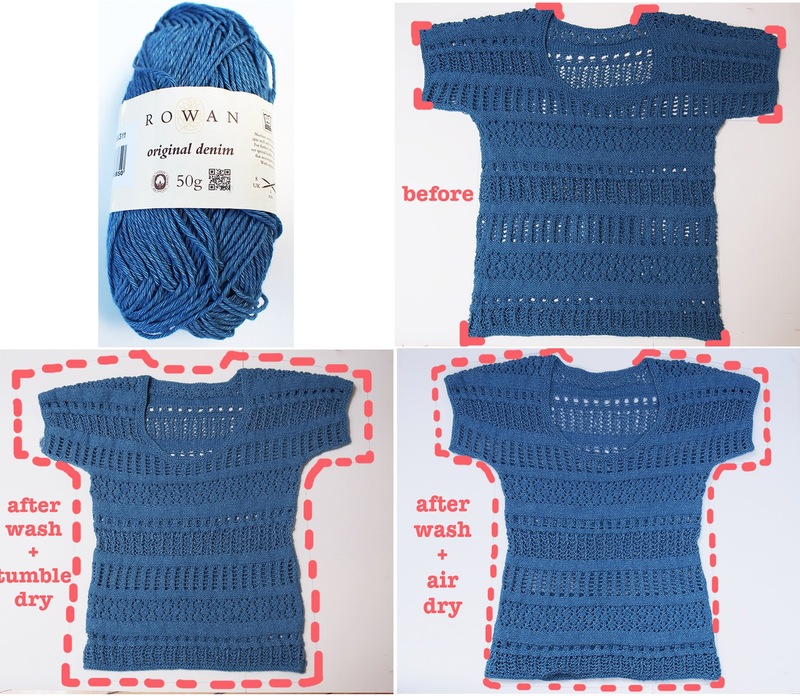 On the ball band it says before washing you will get 28 rows in 10cm (4 inches) and after washing you will have 32 rows per 10cm (4 inches) so that means for every inch (6sts) you need to add one row. Which is what you have come up with. Well done. Thanks for the help with shrinking. My daughter wants a scarf, a wide boofy one, as she puts it and the amount of shrinkage had me concerned. Thanks for the help.